You are currently browsing the tag archive for the ‘pedestrian footpath’ tag. 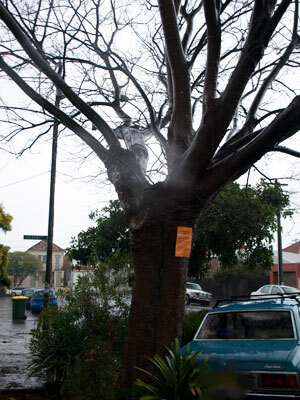 Marrickville Council intends to remove 1 Chinese hackberry (Celtis sinensis) outside 3 Calvert Street Marrickville. Root growth from the tree has apparently caused fence damage on private property. The species is considered a potential environmental weed. 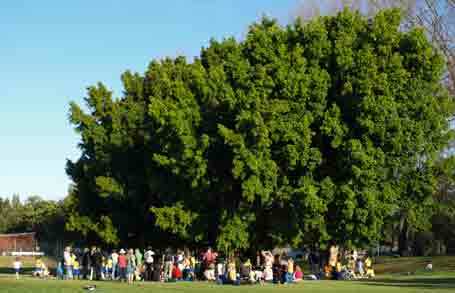 Council say they will replace the tree with a Queensland brush box (Lophostemon confertus) though they don’t say when they will do this. I went to visit this tree today. First impressions were this is a beautiful tree planted in a lovely garden bed making this little area of Calvert Street look very nice. It is the only large tree in the street. 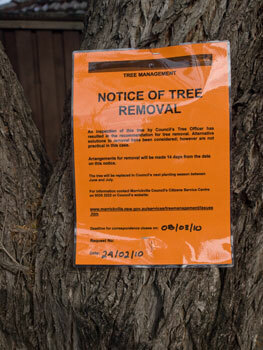 I was sad to see that Council’s Notice of Removal signs were nailed into the tree. I had thought Marrickville Council had ceased this practice as they have been securing signs to trees with sticky tape for the last few months. I did notice that the trees in Toothill Street & Park Road also had their tree removal signs nailed, but as it was a given that these trees would be removed, I made no mention. I am very disappointed that this practice has become the norm, as once again Council is sending a clear message to the community not to bother sending in a submission. 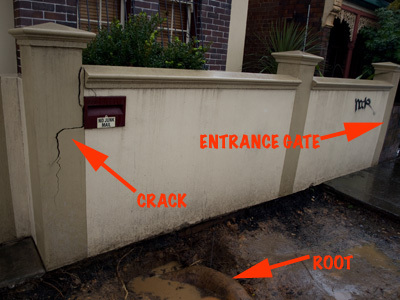 Council has excavated the footpath exposing a large root that travels underneath the brick front fence of the property. No other roots enter the property. The damage to the brick fence appears to be caused by the tree root, but the damage is restricted to one pillar on a 8-10 meter brick fence. As is common with pillars regardless of whether there are trees nearby, the pillar has sustained a medium sized crack, which threatens to disconnect it from the remaining fence. I always take a man experienced in building with me where the tree is said to have caused structural damage. His advice was the fence pillar is unlikely to fall in the near future without some other causative factor like a car crashing into it. He said the fence could be easily repaired by filling the crack with cement & giving it a splash of paint. He said it they were really scared that the pillar might fall, they could fit a connector bolt to secure the pillar to the main fence. I do not believe the damage is sufficient to warrant the removal of this beautiful street tree & will be putting in a submission asking Marrickville Council to repair the footpath, but deny the request to have the tree removed. The tree is mature & healthy. I don’t care that Marrickville Council regards it as a potential environmental weed. They also think Camphor laurel trees are environmental weeds, but City of Sydney Council has retained them as street trees in many places across their LGA such as Glebe Point Road, while Marrickville Council removes them. Calvert Street is one of those streets that has very little green & almost no tree canopy. This tree is important to the local community for the visual beauty & for maintaining property values. It also cleans up pollution from the large volume of traffic that drive through this street every day. It would take many years for a street tree in these conditions to grow to this size. We as a community need to keep all the trees we can. Chinese hackberry is said to compete with native flora & is therefore detrimental to the local environment. However, there is no native environment nearby. Much of what surrounds this tree is cement, buildings & bitumen. 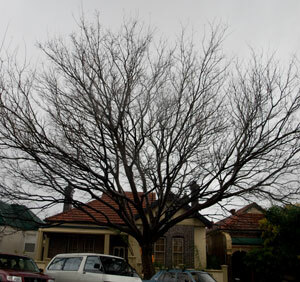 City of Sydney Council protects Chinese hackberry trees if they are 10 metres tall or more. I would only support this tree’s removal if Marrickville Council plants more good-sized street trees along Calvert Street & only at a time when those trees have grown to a decent size. If this tree is removed now, it will denude the street of its greenery & have a negative impact on property values. If it were happening on my street, I would be doing what I could to save this tree because of the impact its removal will have on my property value & the health of my family, especially if the tree was close to my house. I know properties are going for high prices in Marrickville even if they are imbedded in cement, but ask any real estate agent whether a house is likely to go for a higher price if there is a good looking street tree out front & they will say yes. The difference in what a property can sell for is significantly higher. If people realised this, they would never allow street trees to be removed or be butchered by energy companies. As is always the case, if mine is the only submission, the tree will likely go. I ask that you please send a submission to Marrickville Council. You don’t need to live near the tree to be allowed to do this. The trees across the LGA belong to all of us & they benefit all of us. 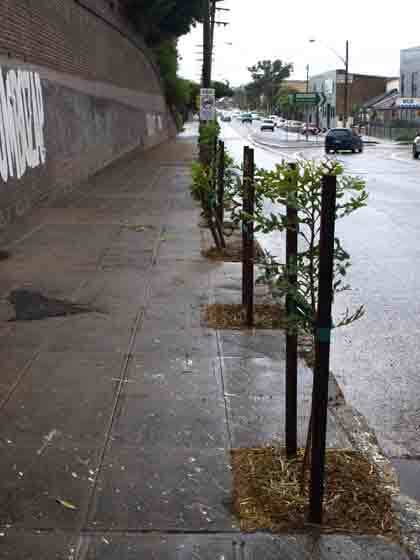 I need others who care about street trees to help by sending in submissions even if the tree is not in their area. 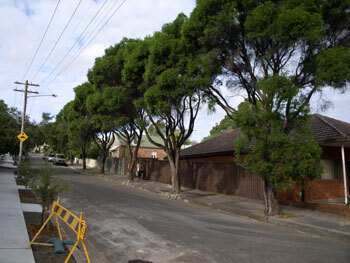 Last week I discovered that 1 large street tree (Revolution Green – Melaleuca bracteata) outside 23 Ivanhoe Street Marrickville South is to be removed. 2 others of the same species along the same stretch of Ivanhoe Street are to be removed near to the corner of Warren Road. I posted last Friday about this saying that Council has nailed notices on the trees. I wish they would stop doing this. It sends a clear message the decision has been pre-determined. Council did not put a notification on their web-site. After my previous post, the notifications appeared on the web-site. I have sincere reservations about Marrickville Council’s capacity to stick to it own procedures & would not be surprised if other trees have been removed without proper notification to the community. This is not a small oversight. Council’s notice on the tree said the community had a period of 2 weeks to send in submissions. Previously it has been 3 weeks. Why the change? Why weren’t we notified of this change? Why the rush? These trees are definitely not dangerous. I visited the trees on Ivanhoe Street & thought that, although the trees could do with a prune to remove some dead undergrowth (normal with this species) & apart from damage to 1 branch from a passing truck, there is nothing wrong with them. Why do they have to remove 3 mature trees that flower prolifically in Spring & attract many birds? The notices on the trees have in the meantime been ripped out, bar one. Therefore, I inspected 4 trees in the vicinity. The trees have lifted up the paving & adjacent gutter because many years ago they were planted in a small hole in the cement. 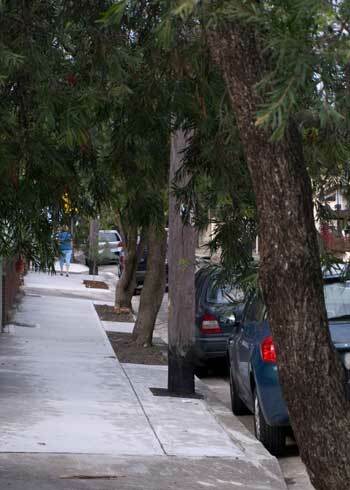 Marrickville Council’s web-site says reason for removal is “as part of a civil works upgrade.” This means there is nothing wrong with the health of the trees. They just want nice neat footpaths. What is really interesting about this is that over the past fortnight, Council have replaced the footpath on the opposite side of Ivanhoe Street & planted 4 more Bottle Bush trees. I had intended to post one of my complimentary posts saying how well Council had done because they not only repaired the footpath, but they also left substantial areas with soil around the new Bottle Brush trees where they will obviously plant something more. I acknowledge that this recent work is wonderful. Footpaths can be fixed. So can gutters. They don’t all have to be uniform at the cost of trees. Trees of this age & size are of far greater benefit to the community & the urban wildlife. Council can retain these trees as well as do the proposed civil works. Like they did on the opposite side of the road, they can remove the restricting cement from around the trunks, fix the kerb & let the community continue to enjoy these trees for a few more years. Council can replace the affected part of the gutter with some cement thinner than is usual. This little bit of guttering will need replacing with new cement anyway. Just make it a bit thinner. 2 other trees are also up for removal. They are both in Steele Park Marrickville South. 1 is a Hills Weeping Fig “before 16 Thornley Street.” Council says, “Decay at base of trunk will lead to whole tree failure.” As I have only just seen the notification, I haven’t visited this tree yet. Council also says there is another tree to go in Steele Park, but the page says there is an error. I will write about these trees when I know more. Warren Road has 3 dead trees that have been sitting there for months. Tempe has 2 dead trees, one of which is very large & a Wattle that is dying for lack of a prune. Victoria Rd Marrickville has a couple of dead trees & many of the Eucalypts around the LGA have dead branches that I have been watching for months. I fear Council wants to allow these branches to become dangerous so they have a reason to remove the whole tree. Their priorities are skewed. They leave dead trees standing, but want to chop down living trees. If Marrickville Council wants to be proud of its climate change policy, they need to chop down trees only as last resort & look after the trees we have before it becomes too late. 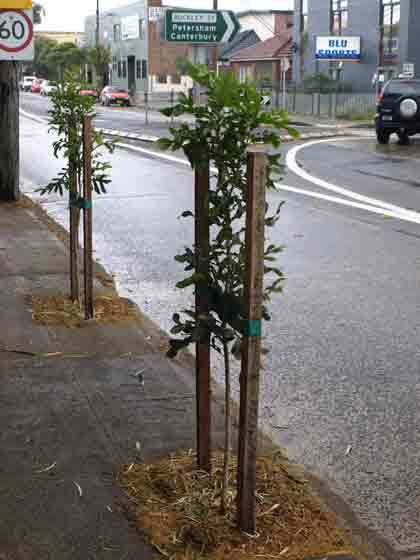 Yesterday I saw Marrickville workers planting street trees outside the small shopping strip in Illawarra Road Marrickville, opposite the Greek Bakery. I was surprised because I had been told that Council doesn’t plant trees in summer. Not only were the Council workers planting trees on the footpath, but also the whole footpath had been repaved with good-looking tiles. This previously rundown area now looks improved & the shopkeepers are very happy having told me this themselves. It will also be a nicer view for the café patrons across the road. 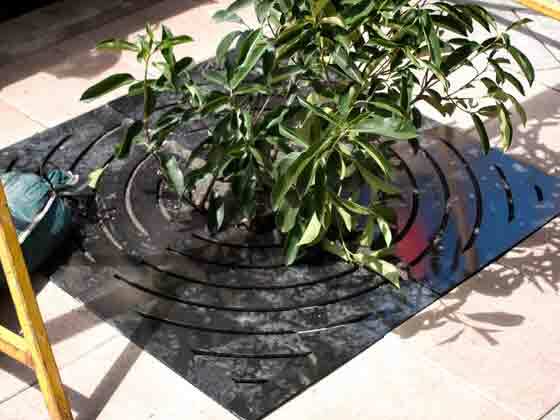 The trees themselves have been planted into large holes covered with good-looking grates. I have not seen this type of grate before. 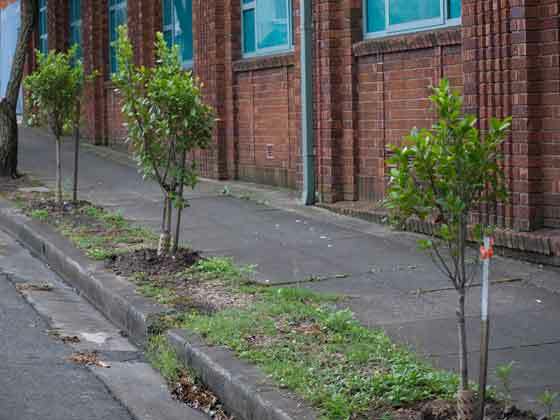 The Council workers told me they have recently planted other street trees along Illawarra Road, up towards the lights at Warren Road & the other small shopping strip next door to Woolworths. Give it a few years & this drab, unimaginative, tired-looking section might look leafy & inviting. Much depends on whether the trees are allowed to develop a canopy or are kept stunted. As Illawarra Road is used as a through-road, these new works & street trees may give passers-by a more favourable impression of Marrickville. I have heard this section of Illawarra Road be described as the ‘gateway to Marrickville,’ especially as this is what you see when you leave the railway station. I also have to eat Humble Pie because when, looking around at the tiles, kerb, concrete & bitumen that surrounded the new trees, I asked the Council workers how they will get water, they told me that the Council will water them until they get established. After that, they are on their own. “How will Council water them?” I asked, imagining a man carrying a watering can. Well, Council has a water truck. Another surprise. I have mentioned the lack of this water truck a number times on this site wishing that Marrickville Council would invest in one. So munch, munch, I’m eating humble-pie, but happily so. There are two questions I get asked often about trees in this LGA & one of them is “why doesn’t Council water the trees?” Well, I am pleased to report that they do. 28th December 09 – New garden bed is absolutely beautiful! I was driving along Carrington Road, Marrickville South the other day when I saw a fantastic garden bed outside New Directions done by Marrickville Council. A large area of concrete has been removed which will make it much easier for the trees to collect water when it rains. The mass of lavender planted around the new street trees is a very nice effect. The garden bed looks beautiful already. I can just imagine how stunning it will look once the plants have filled out a bit. Marrickville Council, you have produced a gorgeous display. You can see in the photo above, there are two other large areas of concrete which have been removed around new street tree plantings. I would be happy if this became the norm rather than the exception on footpaths where there is room as the trees will really benefit in a number of ways. For those who are not familiar with Carrington Road, it is an industrial area with many large factories built probably in the early 1900’s. Thankfully, the rows of tall Palms & Hills Figs along the road are still standing. They were probably planted when the area was established. All these factors make Carrington Road look interesting & greener than most industrial areas. It’s a major road & tourist shopping buses come every week to visit factory outlets. I would guess most people who come in these buses haven’t been to Marrickville before. 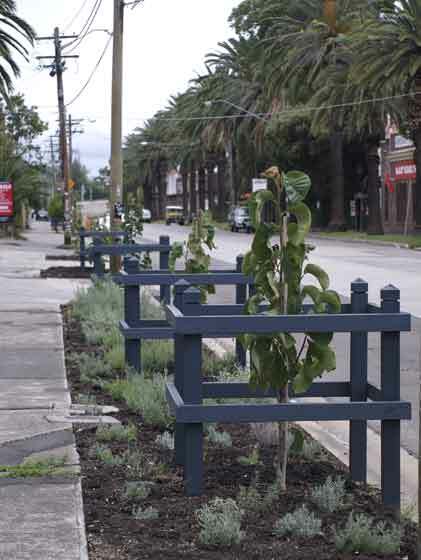 Street planting like this will help give visitors a favourable impression of Marrickville. I hope the staff at New Directions will water the garden bed, as they are major beneficiaries of this particular street work. Well done Marrickville Council. 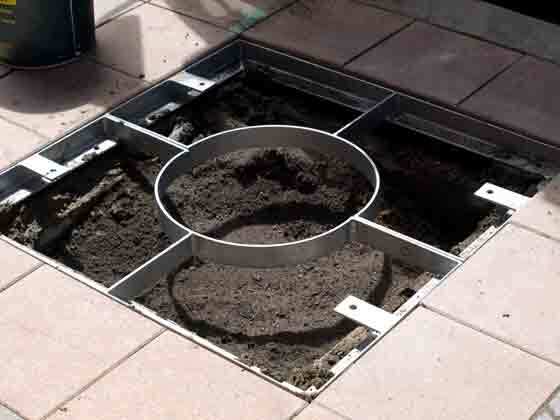 Less concrete, more garden beds like this please. 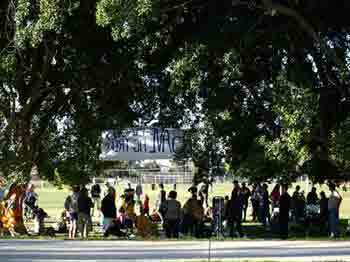 Around 300 gathered under the Figs at Mackey Park this afternoon. I missed most of the action because I was busy gathering signatures for the petition, but it was loud with the sound of happy children & when I looked the adults were smiling too. 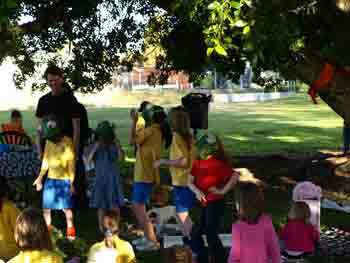 Thanks to Thor Blomfield of Leapfish who entertained the kids with his magic & author Nadia Wheatley who read from her book My Place. Greens Councillor Peter Olive spoke about the need to save the trees for future generations & articulated the Greens efforts to save these trees so far. I didn’t hear Mayor Sam Iskander’s (Labor) whole speech, but I understand he said Labor will vote to save the Fig trees, reversing their original decision to remove these trees. By the time I tuned in there was some disquiet from the audience about the firmness of his sentiment regarding the trees & they questioned him whether Labor would change their mind & keep the central path as well. As far as I understood, the Mayor would not commit to saving the path, which in my mind, includes the lights & the exit opposite Tempe Railway Station. Everyone I spoke to afterwards said it was not absolutely clear about the safety of the trees & the fight to save them is not over yet. They also wanted to save the path, the exit opposite Tempe Station & the lights. Many people said they were annoyed they had to fight to retain these things. At the end of the day I spoke with Labor Councillor Mary O’Sullivan, who said her position is that the trees should be saved. 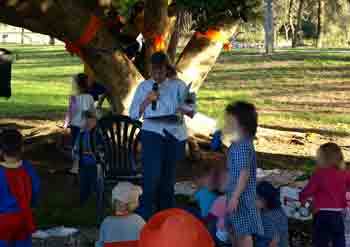 A big thank you to all the community who came in support of the Mackey Fig trees. 145 signed the petition. A young girl came up to me at the end of the day and said; “I think the trees should be saved. They are iconic to the park.” My sentiments exactly! Let’s hope that when this whole process is finished, these 2 magnificent Figs will be left to provide beauty, shade & oxygen to our future generations. Another view of the party - look at the size of these trees! Today I walked along Richardsons Crescent to experience the footpath for myself. I have written about this & added some photos on a page I have called ‘Richardson Footpath’. You can access this page by clicking on the link under SAVING OUR TREES PAGES near the top of the column on the left or at the bar at the top of this page. Don’t forget – there is an online petition – see post below.